18 TOBACCO INTERNATIONAL MARCH 2016 Pricing seems strong. Can it stay that way? Durante : We had a very good 2015. Price was around six percent up, much higher than 2014, also, skewed to the sec- ond half of the year. If you look at February, we have gotten more than 60 percent of the pricing that we expect for the year, so things look very good for 2016 so far, despite some price competitiveness in the low price segment in some markets, but nothing so different than previous years. So, I expect a good year of pricing in 2016. In terms of markets, how have you performed across your regions? Durante : We had a strong year in 2015, as I said before, and it happened across the four regions. Let me start with Asia. Asia has done extremely well in 2015. If we look at the per- formance of the 11 top markets in Asia, we grew share in nine out of 11, and in two, we had a stable share. In places like Pakistan, Bangladesh, Japan, Malaysia, Indonesia, all of those markets have done extremely well. Of course, the region has been impacted by currency trans- lation and transaction, as well as some competitive pricing in Australia. And moving to Western Europe, also a very good performance, we have a much stronger price environ- ment in 2015 than in 2014. We also had the acquisition of TDR that is going to make our business much stronger in Central Europe, I believe there is potential of very good growth in that part of the region. You go to Americas, driven by strong pricing across the region, we have done very, very well on a constant basis, growing revenue and profit strongly. We had good perfor- mance across the region in places like Canada where we have seen a fourth year with strong profit growth, in Chile, and in Brazil, as well, despite the tough economic environ- ment there. But if we look at Brazil, we have a polarization, because Dunhill is doing so well in the premium segment that the brand has grown 120 basis points during the year in the overall market, in a market that has seen some down trad- ing. So it's quite a great performance with this brand. If we look at EEMEA (Eastern Europe, Middle East, and Africa), very strong during the year, very strong perfor- mance, 50 basis points share growth in places like in Russia that grew one share point exit to exit, in 2015. 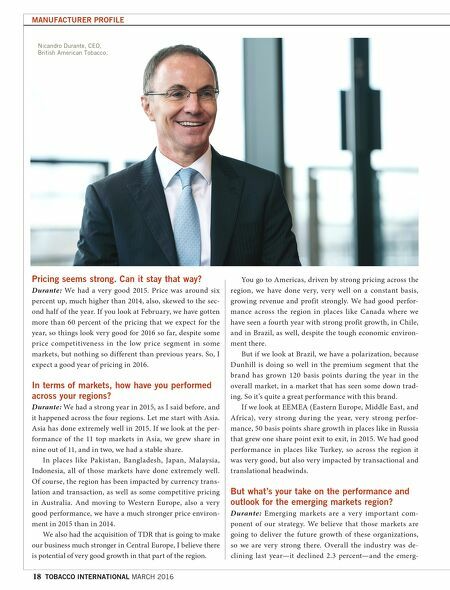 We had good performance in places like Turkey, so across the region it was very good, but also very impacted by transactional and translational headwinds. But what's your take on the performance and outlook for the emerging markets region? Durante : Emerging markets are a ver y important com- ponent of our strategy. We believe that those markets are going to deliver the future growth of these organizations, so we are very strong there. 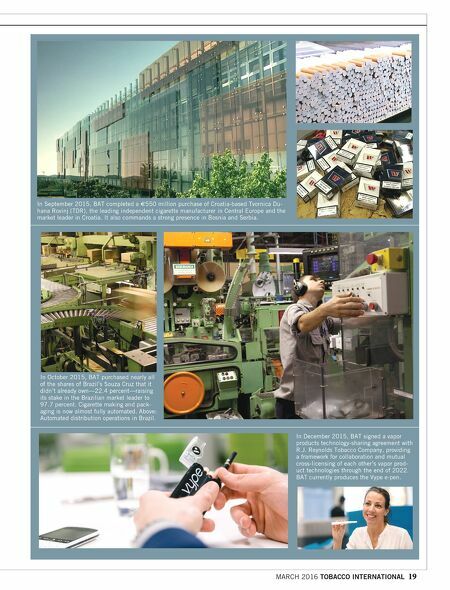 Overall the industry was de- clining last year—it declined 2.3 percent—and the emerg- MANUFACTURER PROFILE Nicandro Durante, CEO, British American Tobacco.